It is very important and beneficial to run a credit check report on your prospective tenant. It not only helps in safeguarding your rental unit but also allows you to get a clear picture of the financial stability of your tenant. It is a fact that you cannot judge a book by its cover so if your would-be tenant has good credit history, it means you can trust the tenant. Screening prospective tenants with a credit check that reveals their credit history will also inform you about an important aspect of utility bills payment. With the credit check report you will get to know whether the prospective tenant pays bills on time or not because timely payment of utility bills would mean your rent will also be paid on time. What information do you get from a tenant’s Credit Check Report? There are two points to be noted while considering the information to be reviewed. Firstly, the information is bound to be varied as it totally depends upon the agency you have chosen and the credit check policy they follow. Secondly, the amount you pay for the credit check report will also play a determining role in this context. Personal identification verification: You will get verification of the prospective tenant’s name, date of birth, marital status and spouse name, previous and current residential addresses, Social Security number and employers (if not self-employed). Credit History: It includes information about bank accounts (since when the accounts have been activated), credit card accounts and credit card limit, mortgages and loan amount (if any) and pattern of payment over the past two years. Public Records: It will provide a list of tax liens, civil judgments, any reported evictions and bankruptcies. Inquiries: if anyone has requested a credit report of your prospective tenant previously then the information will be provided in the credit check. Remember that some credit check reports may also provide the FICO score of the prospective tenant you are screening. Tenant Related Requirements for Running the Credit Check? To obtain your prospective tenant’s credit history you need to follow the Fair Credit Reporting Act guidelines. According to the law you must ask for the applicant’s written permission to do so and the tenant will be required to sign and date a legally acceptable document to show that they agree to the credit check. Usually landlords include this condition at the end of the Tenant Application Form, so, if your form doesn’t include this point then it will be important to get a separate document signed by the tenant. Usually it takes about 2 to 10 days for the application to receive approval and once it is approved, the subsequent process will be speedy as you will be able to run the credit check quickly. There are various options in this regard such as you can choose from Mr. Landlord, E-Renter, Experian, etc. ; these are names of some of the agencies that facilitate tenant screenings especially credit checks for landlords. You need to perform an extensive search online to look for other options and to find the right agency. Never give personal information to any agency prior to doing your homework and ensuring that the agency is accredited and reliable. It is important because you are handing over confidential information to the company and if it lands in wrong hands you can easily become the victim of identity theft as the agency might carry out malicious schemes in your name. How to Run the Credit Check? If you have the Social Security number of the prospective tenant or other information, use it to run the credit check by applying to the agency of your choice. You will be required to send the signed consent form of the tenant to the company via fax or email. Some companies provide the credit check within a few minutes while some may take time of a few days. When you receive the credit report, review it carefully. Check all the points mentioned above including chronic late payments and unpaid accounts. Look for debt as well; even if the applicant pays the utility bills on time but it is mandatory to check out the amount of debt he or she has. That is, if most of the tenant’s monthly income is committed already then it would be difficult to pay you rent on time. Good credit is good news since this would mean the applicant pays bills on time. However, please remember that credit reports may also contain unverified or fake information as these aren’t foolproof. There are hordes of scam professionals and social engineering geniuses who can falsify data. Therefore, be sure that you get set the same move-in conditions for everyone and never accept renters if they haven’t transferred the security deposit. Lastly, if there are certain aspects of the prospective tenant’s credit report that are concerning to you, openly discuss with the applicant since there is always a possibility of mistake on the report and the tenant may not be aware of it. 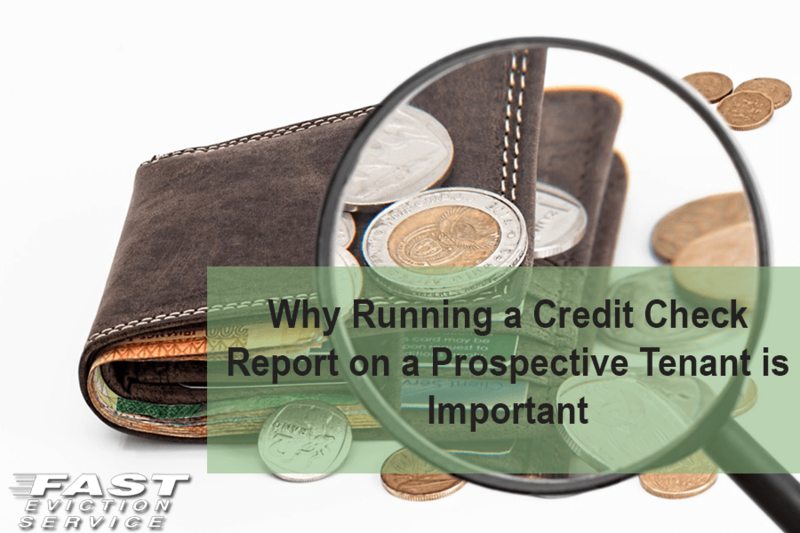 However, if the credit report is negative then that’s why you ran a prospective tenant credit check to screen out bad tenants – and you must not rent your property to that applicant because of the bad credit.